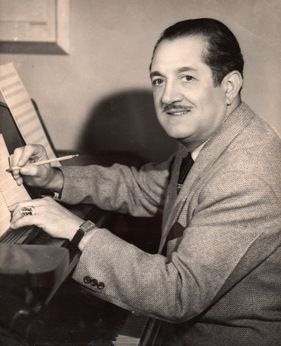 Composer Rafael Petitón Guzmán was known as "the ambassador of merengue." 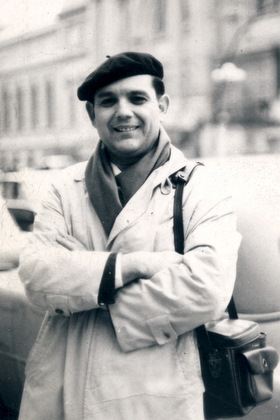 Early photo of Tito Enrique Cánepa Jiménez in New York. “El Músico y el Pintor/ The Musician and the Painter: An Exhibit Documenting the Lifetime, Work, and Artistic Trajectory of Two Early Twentieth Century Dominican Artists in New York,” will be on view February 15 through March 27 at the CUNY Dominican Studies Institute Archives and Library. The Archives and Library are on the second floor of the North Academic Center at The City College of New York. The exhibit consists of 16 panels, documents, photographs, musical scores, and paintings from the Dominican Archives collections that highlight the careers of musician Rafael Petitón Guzmán and painter Tito Enrique Cánepa. It is conceived as a traveling exhibit that will be made available to other institutions after its exhibition at City College concludes. The archival collections of both artists provide a remarkable glimpse of early 20th century cultural history of Dominicans and Latinos in New York City. Maestro Petitón Guzmán and Cánepa were enormously influential in their chosen professions. They contributed to the development of new hybrid artistic forms that combine traditional and modern elements and incorporate styles from different cultures. 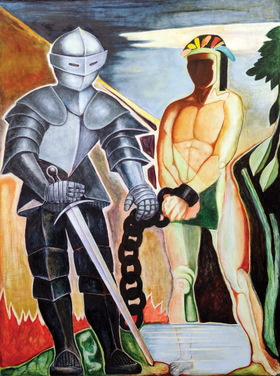 Cánepa, in particular, used his art to express political themes, chiefly his opposition to tyranny and imperialism. Petitón Guzmán used eclecticism and formal innovation as the vehicle of his revolt. Maestro Rafael Petitón Guzmán was born in Salcedo, Dominican Republic, in 1894 and received his earliest musical training from his father, Edilio Petitón, an excellent amateur musician. Later, he continued his music studies in Puerto Rico on a scholarship from the Dominican government. He moved to New York City in 1935, where he studied at the prestigious Juilliard School of Music under the tutelage of famous conductor Leopold Stokowski. Maestro Petitón Guzmán went on to form the first known Dominican-led orchestra in New York City, Lira Dominicana, which performed in popular New York City ballrooms in the 1930s and 1940s. He performed at many premiere venues in New York City including Radio City Music Hall, the Stork Club, the Cuban Casino and the Copacabana. Maestro Petitón Guzmán was one of the first musicians to introduce “merengue” to New York City audiences, and he became known as “the ambassador of merengue.” In addition to being a talented pianist, percussionist and music teacher, he was a prolific composer who used his well-rounded classical music foundation to compose in a myriad of Latin folk and popular musical genres including bolero, chachachá, guaracha, mambo, merengue, pachanga, rumba and tango. The Rafael Petitón Guzmán collection in the Dominican Archives consists of approximately eight cubic feet of original music scores, lyrics, sound recordings, musical arrangements, compositions, personal documents, photographs, and memorabilia of the composer and his family. Among the items are unpublished and unedited music. The music collection is available for research purposes to musicians, educators, students, historians, and researchers interested in early and mid-20th century Latin American music and the history and culture of the Dominican population in the United States. Painter Tito Enrique Cánepa Jiménez was born in 1916 in San Pedro de Macorís, Dominican Republic. In the early 1930s, he began to protest the increasingly totalitarian regime of Rafael Leonidas Trujillo Molina. As a result of his political activities, his parents sent him to Puerto Rico and then to New York City. Upon his arrival in New York City in the mid-1930s, Cánepa worked in the Experimental Workshop led by Mexican muralist David Alfaro Siqueiros and Bolivian painter Roberto Berdecio. These two artists and Dominican art historian Américo Lugo strongly influenced Cánepa’s style of painting. Cánepa’s paintings display a strong commitment to portraying Dominican political, cultural, and religious life, and often contain explicit political content. Important Dominican political figures portrayed in his paintings include Juan Pablo Duarte and Gregorio Luperón, heroes of Dominican independence and thought, and the Mirabal sisters, who were opponents of the Trujillo regime. The Tito Enrique Cánepa Jiménez Collection consists of approximately seven cubic feet of: drawings and sketches; correspondence with his cousin, Dominican social scientist and educator Juan Isidro Jiménez Grullón (1945-1982); subject files; motion pictures and newsreel; photographs and contact prints depicting Cánepa, his family, and his paintings, and other documents produced or collected by Cánepa. The collection also contains three paintings: “Ojeda y Caonabo” (1984), “The Mirabal Sisters” (1985), and “The Gulf of Arrows” (1987). • To advance research and teaching at the City University of New York focusing on the Dominican people. Institutions interested in displaying the exhibit should contact the CUNY Dominican Studies Institute Archives at 212.650.8865, dsiarchives @ccny.cuny.edu, and ask to speak with the chief archivist, Don Idilio Gracia Peña.